WHETHER or not Barack Obama would make a good president, it’s clear that he makes an excellent muse. It’s hard to think of a political candidate in recent memory who has, in real time, inspired so much creativity, exercised free of charge and for the campaign’s benefit. Perhaps this suggests something about Obama – or maybe it suggests something about his supporters. In addition to popping up on many streets, the image later made its way onto a T-shirt, created in collaboration with the San Francisco street-wear brand Upper Playground – and apparently onto the radar of the Obama campaign. 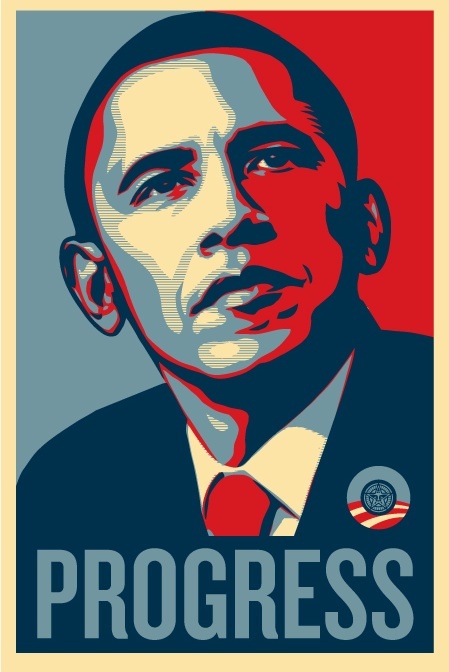 The candidate himself sent a thank-you note, and his campaign had Fairey create a new poster that became the inaugural offering in an “Artists for Obama” section of the barackobama.com online store. Fairey told Creativity Online that while he has been politically active, there’s something new in the enthusiasm he now professes to feel. “I just thought it was time to stick my neck out,” he said. A variety of other artists apparently feel something similar. A California art duo known as the Date Farmers created an Obama screen print in an edition of 300; add the pro-Obama prints by Sam Flores, MAC and Munk One, and you’re on your way to a hipster gallery show. Meanwhile, will.i.am of the Black Eyed Peas created a video that remixed an Obama speech into a song, with a variety of music-celebrity contributors joining in on the candidate’s oft-cited slogan, “Yes, we can.” It’s had more than 6.5 million YouTube views and inspired spinoffs, including a “No, you can’t” video by the satirical Billionaires for Bush. As Advertising Age has noted, a variety of ad-world “creatives” (it’s actually a job title in that industry) have also cooked up freelance online videos and the like, free. The grass-roots end of the creativity spectrum has included ObamaOfDreams.com, which offered T-shirts on which baseball team logos were tweaked to read “Obama” (until Major League Baseball intervened), and a D.I.Y. “O’bama” St. Patrick’s Day dress recently featured on Craftzine.com. Creative types have backed politicians before, and Obama does not have a monopoly on such expression even in the Democratic primary. (There’s Jack Nicholson’s somewhat strange pro-Clinton clip made up of spliced-together movie performances, for instance.) But the Obama endorsements seem not simply expressions of support, but of something more like fandom. Dan Ariely, a behavioral-economics professor at M.I.T. and author of the recent book “Predictably Irrational,” has gone so far as to compare it to romance, citing research about the early stages of dating as a comparison point: “When we get partial information about others we tend to fill in the gaps optimistically; we assume that they are wonderful, just like us and that they share our exact values and preferences.” He figures part of Obama’s charm may be the way fans are filling in the blanks. This brings us to perhaps the most delightful piece of Obama-inspired creativity, the Web site barackobamaisyournewbicycle.com. This is nothing but a series of statements about the wonderful things Obama has done for “you.” He left a comment on your blog, picked you up at the airport, built you a robot, thinks you are cute and, sweetly: “Barack Obama has a balloon for you.” The site has been read as support – and as a satire of crush-blind Obama supporters. Of course this ambiguity is what makes it so pleasing. Because perfect little things like this are invariably converted into profitable objects, a deal has been struck to release an illustrated book based on the site. The stated goal to get it into stores before the Democratic convention reflects a reality lurking behind the political optimism: all the creative expression in the world doesn’t guarantee that we’ll ever find out what sort of president Obama might be. Barack a Mac? Hillary a PC? STYLES make fights – or so goes the boxing cliché. In 2008, they make presidential campaigns, too. This is especially true for the two remaining Democrats, Hillary Clinton and Barack Obama. Reporters covering the candidates have already resorted to traditional analysis of style – fashion choices, manner of speaking, even the way they laugh. Yet, according to design experts, the candidates have left a clear blueprint of their personal style – perhaps even a window into their souls – through the Web sites they have created to raise money, recruit volunteers and generally meet-and-greet online. That is, Mr. Obama’s site is more harmonious, with plenty of white space and a soft blue palette. Its task bar is reminiscent of the one used at Apple’s iTunes site. It signals in myriad ways that it was designed with a younger, more tech-savvy audience in mind – using branding techniques similar to the ones that have made the iPod so popular. “With Obama’s site, all the features and elements are seamlessly integrated, just like the experience of using a program on a Macintosh computer,” said Alice Twemlow, chairwoman of the M.F.A. program in design criticism at the School of Visual Arts (who is a Mac user). It is designed, she said, even down to the playful logos that illustrate choices like, Volunteer or Register to Vote. She likened those touches to the elaborate, painstaking packaging Apple uses to woo its customers. The linking of Mr. Obama with Mac and Mrs. Clinton with PCs has already become something of a theme during the primary. Early in the campaign, a popular YouTube parody of Apple’s “1984” Super Bowl ad made Mrs. Clinton the face of oppression. This week on The Huffington Post, Douglas T. Kendall, the founder of the Community Rights Counsel, a public interest law firm, made the connection more explicit. But the designers believe the comparisons – but not perhaps the Orwellian overtones – are apt. In contrast to barackobama.com, Mrs. Clinton’s site uses a more traditional color scheme of dark blue, has sharper lines dividing content and employs cookie-cutter icons next to its buttons for volunteering, and the like. “Hillary’s is way more hectic, it’s got all these, what look like parody ads,” said Ms. Twemlow, who is not a citizen and cannot vote in the election. But the compliments are clearly double-edged. While Apple’s ad campaign maligns the PC by using an annoying man in a plain suit as its personification, it is not clear that aligning with the trendy Mac aesthetic is good politics. The iPod may be a dominant music player, but the Mac is still a niche computer. PC, no doubt, would win the Electoral College by historic proportions (with Mac perhaps carrying Vermont). While Mr. Santa Maria praised barackobama.com for having “this welcoming quality,” he added that it was “ethereal, vaporous and someone could construe it as nebulous.” He said there was a bit of the “Lifetime channel effect, you know, vasoline on the lens” to create a softer effect on the viewer. The “hectic” site that the Clinton campaign is offering could actually be quite strategic, exactly in step with her branding. After all, Mrs. Clinton repeatedly emphasizes how hard she will work for the average American “starting on Day 1.” If she comes across as energetic online, that may simply be her intention. If she shouts a bit more, typographically speaking, that may be the better to be heard. Unlike the Republicans, the Democratic contenders have incorporated social-networking tools to their sites – allowing supporters to create their own groups, for example, though Mr. Obama is considered the pacesetter in that regard. “Obama’s campaign gained attention here in the Bay area tech community early on when he launched the My.BarackObama.com portal that allowed for personal blogging from the public, messaging with other supporters, and a host of other tools,” Ms. Chang wrote in an e-mail message. In the long run, however, Mr. Lessig believes that it is the ability to motivate the electorate that matters, not simple matters of style. And he’s a Mac user from way back. MANY designers have waxed admiringly about Barack Obama’s sophisticated typographical design scheme, particularly the consistent use in much of his graphic material of the typeface Gotham, designed by Tobias Frere-Jones. So I called Brian Collins, an expert on branding, to get his thoughts on what this “good design” means for the candidate. Steven Heller: As a branding expert, can you tell me what it is about the typographical scheme of Senator Obama’s campaign that is unlike his challengers’? Brian Collins: John McCain’s, Hillary Clinton’s and Barack Obama’s campaigns all make good efforts to brand their messages consistently. And that’s incredibly hard to do. Just imagine the thousands of volunteers and endless elements they must orchestrate from town to town, state to state. 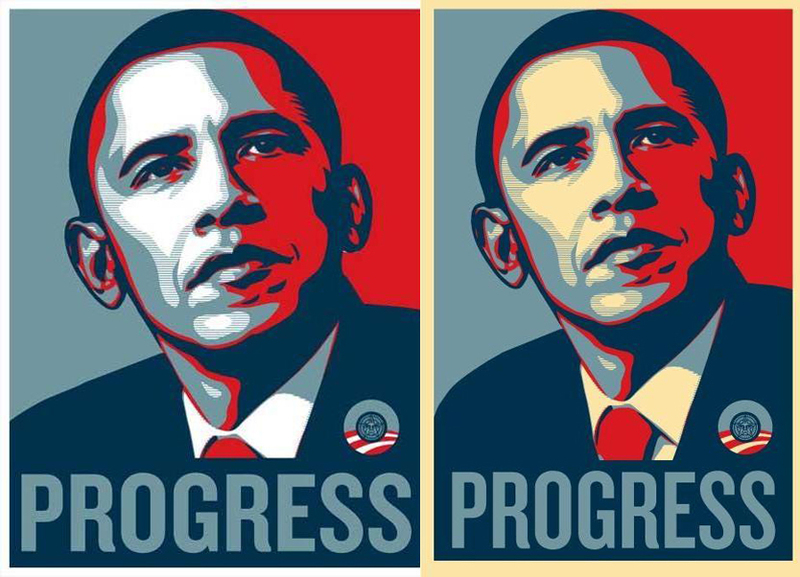 But as a result of their approach to design, the Obama campaign really stands out. From the bold “change” signs to their engaging Web site to their recognizable lapel pins, they’ve used a single-minded visual strategy to deliver their campaign’s message with greater consistency and, as a result, greater collective impact. The use of typography is the linchpin to the program. Type is language made visible. Senator Obama has been noted for his eloquence, so it’s not surprising that someone so rhetorically gifted would understand how strong typography is and how it helps bring his words – and his campaign’s message – to life. Q: The other campaigns are less typographically successful. Is maintaining a strong design program really so difficult? A: I think the real story here is less about typography than it is about discipline. Political campaigns are the Brigadoon of branding. There’s a compressed amount of time to tell a candidate’s story before the race is over and the campaign vanishes. During that window, the campaign must make sure that everything it produces – everything it touches – delivers the candidate’s message in a meaningful way. No opportunity to amplify that story should be missed. The Obama people have used design to take that discipline to a whole new level. 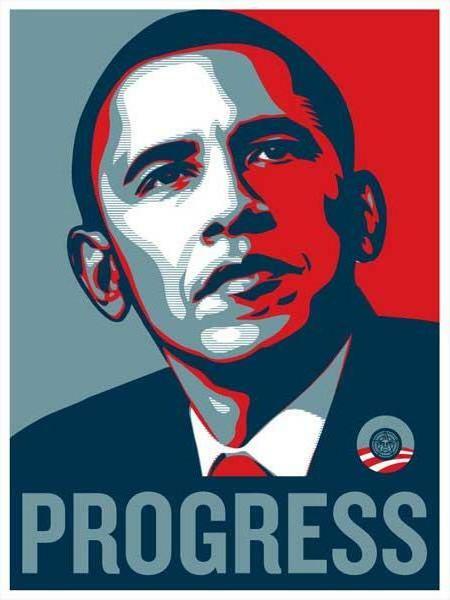 Barack Obama is running the first real transmedia campaign of the 21st century. His people not only understand how media has splintered, but how audiences have splintered, too. Cell phones, mobile devices, Web sites, e-mail, social networks, iPods, laptops, billboards, print ads and campaign events are now just as important as television. The senator’s design strategy has given these diverse platforms (and their different audiences) a coherence that makes them all work together. I’ve worked with giant, global corporations who don’t do it this well. Q: What is it about the typeface Gotham that adds personality to the Obama brand? A: I don’t think that Gotham adds any personality to Senator Obama’s brand. I think it just amplifies the personality that’s already there. In fact, the typeface would work just as well for John McCain or Hillary Clinton, for that matter. With that said, though, there’s an oxymoronic quality to Gotham, which is why I think it’s become so popular. It has a blunt, geometric simplicity, which usually makes words feel cold and analytical (like Univers), but it also feels warm. It’s substantial yet friendly. Up-to-date yet familiar. That’s a tough hat trick. And Gotham has another quality that makes it succeed: it just looks matter-of-fact. But perhaps any typeface inspired by signs at the Port Authority Bus Terminal in New York City — as Gotham is — will look like that. Q: Could this have been accomplished with other typeface(s)? A: Yes. But most of them have been crafted within the last decade or so. Newer fonts don’t carry as much historical visual baggage for candidates looking to the future instead of the past. Among them would be a typeface called Whitney. We used it in the new identity program we did for Kodak. It has many of the same qualities I like in Gotham. But Whitney’s roots are in calligraphy, not geometry. So it’s a bit more handmade, more friendly. 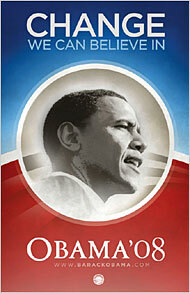 Q: What is the most significant trait that emerges from all Senator Obama’s campaign artifacts? A: I was most impressed by one artifact: the signs that turn each campaign state into a logo for the Obama campaign. I’ve never seen anything quite like that before. I think it’s clever. But it also works as it makes each state feel part of a larger, national movement. Q: Do you think the typographical style actually makes a difference? A: You bet I do. Style equals accuracy. Put the word “change” in Comic Sans and the idea feels lightweight and silly. Place it in Times Roman and it feels self-important. In Gotham, it feels just right. Inspiring, not threatening. In the end, typography makes a real difference when it delivers words and ideas that are relevant to people. And for many, that seems to be the case here.